How does Xenomai deliver real-time? Single or dual kernel configuration? Do you need non-POSIX real-time APIs? Xenomai is supported on a variety of hardware. The ports we know about are listed here. By supplementing Linux with a real-time co-kernel running side-by-side with it. This small extension named Cobalt is built into the Linux kernel, dealing with all time-critical activities, such as handling interrupts, and scheduling real-time threads. The Cobalt core has higher priority over the native kernel activities. 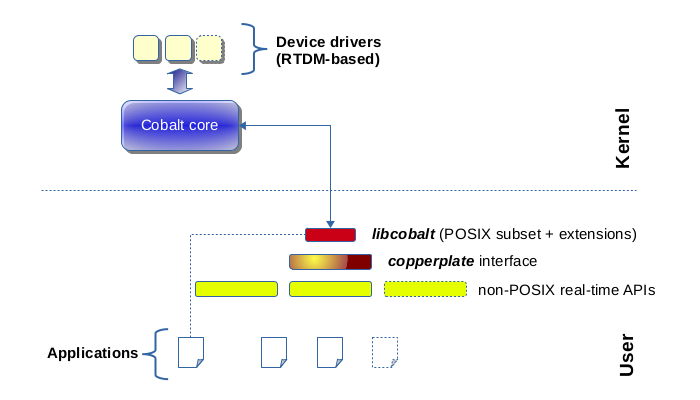 In this dual kernel configuration, all the RTOS APIs Xenomai provides interface with the Cobalt core, and only those APIs are deemed real-time capable, including the subset of POSIX 1003.1c services implemented by Xenomai (aka libcobalt). Cobalt is an evolution of the former Xenomai 2 architecture. By relying on the real-time capabilities of the native Linux kernel, forming the Mercury core. Often, applications will require the PREEMPT-RT extension to be enabled in the target kernel, for delivering real-time services. However, this is not mandatory, it depends on the application requirements with respect to responsiveness and maximum jitter; some may even tolerate a certain percentage of deadline misses. In this single kernel configuration, all the non-POSIX RTOS APIs Xenomai provides are accurately emulated over the native threading library (preferably NPTL, but also supports linuxthreads for legacy setups). Xenomai 3 supports both the single and dual kernel configurations. The discontinued Xenomai 2 architecture only supported the dual kernel configuration. All Xenomai code running in kernel space is licensed under the terms of the Linux kernel license, i.e. GPL v2. Xenomai libraries linked to applications are licensed under the terms of the LGPL v2.1. For information regarding a particular software component, you should look at the COPYING file available in the directory containing the relevant source code. Does your application actually have real-time requirements, and how stringent are they? If migrating an application from an embedded RTOS to a Linux-based platform, the question may stand because unlike legacy RTOSes, Linux sees embedded and real-time characteristics as orthogonal issues. Some migrated applications may even be fine with only emulating the original RTOS API over a regular kernel and standard preemption (CONFIG_PREEMPT). Those may benefit from Xenomai 3 in single kernel configuration. For stringent real-time requirements, you should consider the availability of the hard real-time support for your target SoC architecture and Linux kernel version. Hardware support for Xenomai in dual kernel configuration can be viewed here. This technology is based on a kernel patch which introduces a mechanism for diverting all critical events to a dual kernel extension, coupled to the host Linux kernel. This mechanism called the Interrupt pipeline (aka I-Pipe) is described in details by this (outdated) document. All I-pipe patches available for various kernel releases can be fetched at this site. For a single kernel configuration, the list of target architectures supporting the full preemption features (aka PREEMPT-RT) is available here. How many CPU cores will be involved in real-time operations? in a dual kernel configuration, the Xenomai co-kernel normally benefits from its simpler locking scheme when dealing with real-time activities concurrently on not more than four CPU cores. Beyond four CPU cores running real-time activities, SMP scalability will be better with a single kernel configuration. The key issue is with the number of CPU cores actually running real-time threads and receiving interrupts from real-time sources, not with the overall number of cores on line on the target hardware. Because the Cobalt co-kernel does not share any lock with the regular Linux kernel when dealing with real-time activities, a 16-way server pinning such activities on not more than four of the available cores would still deliver good performances in a Cobalt-based dual kernel configuration. Is any of those dual kernel pros critical to your case? porting the Cobalt co-kernel to a new architecture is fairly simple. it is decoupled from the development cycle of the mainline Linux kernel, thus allowing to pick the desired (or required) kernel version more freely. it can simplify the worst-case analysis and keeps the results valid over update cycles of the mainline Linux kernel which hosts it. it allows to fine-tune the non-real-time part for throughput without negative impact on the real-time job. it does not require any tuning of the regular Linux system to guarantee short and bounded latencies for the real-time job. Is any of those single kernel pros critical to your case? the stock kernel drivers can be reused by real-time applications with no change (provided they don’t create latency issues due to an unfortunate implementation). On the other hand, drivers need to be specifically implemented for running over a dual kernel configuration, i.e. 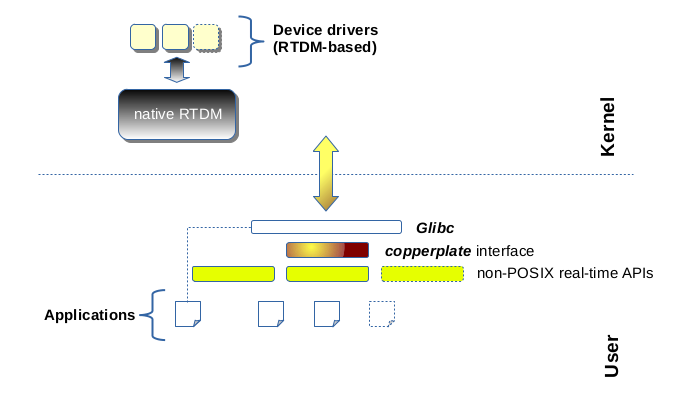 over the in-kernel RTDM interface. the programming model may be simpler than with a dual kernel configuration, since the kernel is deemed to enforce real-time behavior globally. This said, cautious application design and implementation must be a common rule regardless of the underlying real-time technology, as not all available services may be suited for real-time usage. all standard utilities for monitoring the system operations can report about the real-time activities out of the box. On the other hand, a dual kernel system has to adapt such tools specifically for this purpose. Porting legacy non-POSIX applications to POSIX may not be the best option. Although there may be similarities, the semantics of traditional RTOS APIs may differ significantly from POSIX in many cases, which often makes the migration process quite painful and error-prone. Xenomai ships with emulators of traditional RTOS APIs, like VxWorks™ and pSOS™, both available in single and dual kernel configurations. Xenomai aims at accurately mimicking the original services with low overhead. However, maybe Xenomai does not provide an emulator yet for the API you are looking for, or some services are missing from the existing emulators, in which case you should consider raising the topic on the e-mail discussion list. Xenomai is based on generic building blocks for implementing RTOS APIs, so extending it is a documented option. a Linux kernel ported to your target SoC or platform. If possible, prefer mainline kernel releases over vendor-originated ones. Among other issues, kernel patches required for running hard real-time applications over single (PREEMPT_RT) or dual kernel (I-pipe) configurations are commonly based over mainline kernels. for a dual kernel configuration, an I-pipe patch fitting your target kernel. If you don’t find any patch that matches exactly but feel lucky, you may try applying a patch issued against a kernel only differing by its sublevel release number, e.g. from 3.10.22 to 3.10.20. However, even if it applies cleanly, some extra testing is required, and getting additional information from the e-mail discussion list may help. for a single kernel configuration with hard real-time capabilities, a PREEMPT-RT patch matching your target kernel. Xenomai 3 is the current architecture, aimed at supporting both the single and dual kernel configurations. The Xenomai project issues a tarball for each official stable or candidate release. However, we recommend tracking our development and/or maintenance GIT trees, for getting the latest fixes. The GIT project documentation hub. This document contains instructions for building and installing Xenomai 3.x. This document describes the Xenomai source code repositories we maintain with GIT. This is where the interrupt pipeline and the Cobalt co-kernel development takes place. First and foremost, please make sure to have a look at the troubleshooting guide. If running any release from the discontinued Xenomai 2 series, or a Xenomai 3 release using the Cobalt real-time core, then you are running a dual kernel configuration. Xenomai 3 over the Mercury core stands for a single kernel configuration. If still out of luck, and if your favorite Internet search engine did not help finding a similar/same problem already solved for another user, then you should try raising the issue on the main e-mail discussion list. To maximize your chances of receiving quick and accurate responses to your request for help, you really want to follow these recommendations. The Yocto-based Embedded Linux Development Kit (aka ELDK) includes pre-built GNU cross-development tools and bootable root file systems for a variety of ARM™, PowerPC™ and MIPS™ embedded target systems. It also ships with a pre-built stable Xenomai release. This document provides a brief history of the Xenomai project, from its inception in 2001 to the recent years. Image processing with Xenomai 2 by Xerox UK, presented at the Xenomai User Meeting '09. Building Embedded Linux Systems, Second Edition. This book dedicates a chapter explaining the dual kernel architecture of Xenomai 2. Xenomai: the RTOS Chameleon for Linux, at Open Source Meets Business, Nürnberg, Germany, January 2007. Semi-autonomous service robots at the ELROB 2006.